Opening Reception: April 26, 2015 – 2-5pmJerri Allyn, Christopher Alvarez, Andrew Alcaraz, Deandra Blade, Jonathon Carrillo, Jacque Culpepper, Edgar Estrella, Yasmin Garcia, Samuel Jones, Miranda Juarez, Sam Lopez, Rosanna Seimeca, Roland Smith, Rayleen Thompson, Emily Varela, Marjan K. Vayghan, Elizabeth White, and Angel Zavala. Jerri Allyn is interested in civic engagement. The nature of her work moves between art settings, academia and targeted communities, providing a forum for the multiple voices with whom she collaborates. Allyn creates site-oriented, interactive, new genre installations and performance art events that become a part of publiclife, and build on connections between the art world, activist organizations and others through aligned interests. Her projects often include public programs that expand on scholarly and secular concerns. Feminist Art represents one of the lineages from the 70’s that have developed “performative interactions” characterized by engagement, dialogue and social change. April 26 – June 6, 2015Artistic solutions, also known as creative referendums, developed by nine members of an Artist Team are framed within two cargo containers temporarily sited in Angels Gate Park overlooking the Port – an alluring metaphor given that some people smuggled into the US arrive in shipping containers. The real cost of some dolls, made by child labor, may be too high. 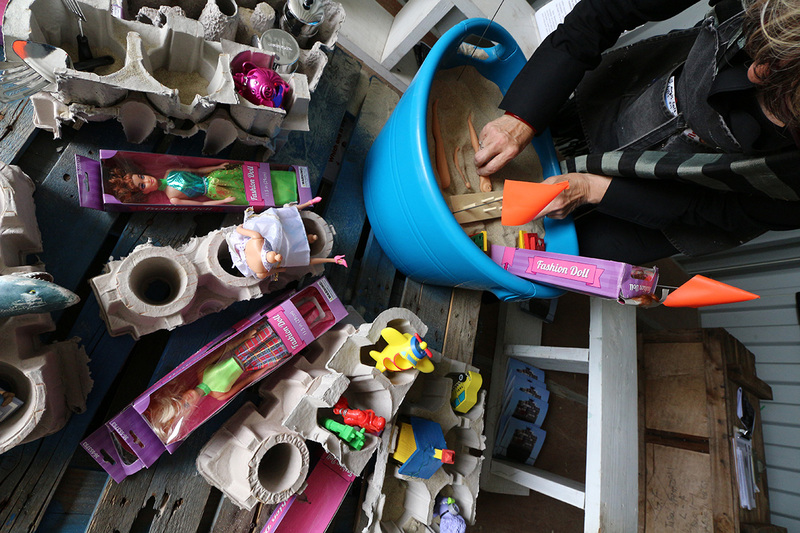 Consider buying toys for children from local companies or those with fair labor practices. Vayghan performs as a “psychic art therapist,” “interpreting” the constructions of participants who create a tableau from broken dolls and toys in the installation. 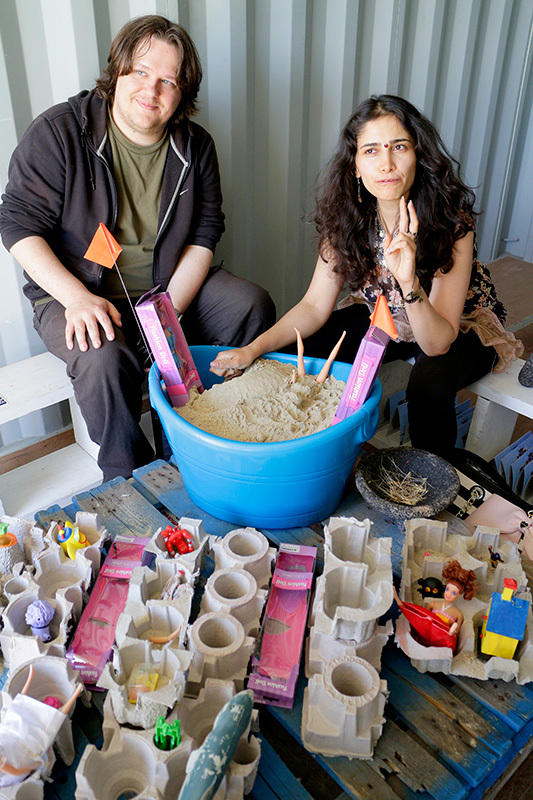 Inspired by Carl Jung, “sand-play” is a therapeutic technique that facilitates the psyche’s natural capacity for healing. 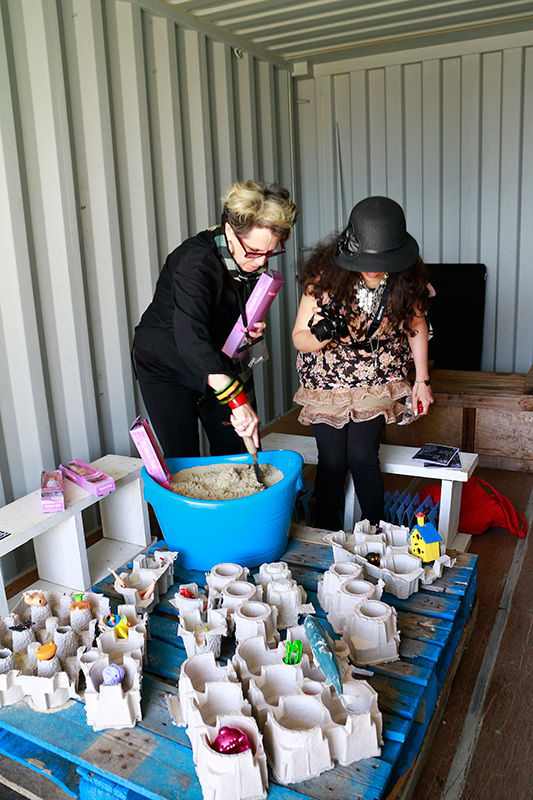 In a “free, protected space” with a therapist, a client creates a manifestation of their imagined world using sand, water and objects. Click here for Leah Solo and Marjan Vayghan artist bios. Leah Solo aka Lisa Solomon is an artist, performer and activist who is launching a private practice as a multi-lingual creative arts therapist. She is a doctoral candidate at the California Institute of Integral Studies in Women’s Spirituality, has an MA in Depth Psychology, and a BA in Humanities. Art, therapy, nutrition, vision therapy and neuro-feedback inform her creative work. A member of the Screen Actors Guild, she has performed in theaters and museums internationally. Solo is excited to raise awareness about exploitation and trafficking in relation to capitalism worldwide and consumerism in the United States. Marjan Khoshbakhti Vayghan, born to Azerbaijani parents in Tehran, Iran in 1984, emigrated to the United States in the Spring of 1995, settling with her family in Los Angeles, California. Marjan continues to live alternately between Teheran and Los Angeles. Her practice is informed by this context of movement and flexible citizenship across both geographical and cultural spaces, and the multiple realities these spaces engender.